Learning Six Sigma CAN be a painless process! Six Sigma is among the most effective process methods used today--and it's also among the most baffling topics to those new to the subject. 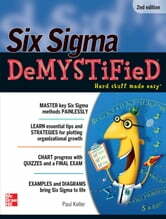 The good news is Six Sigma DeMYSTiFieD, second edition, explains it all in a language you'll understand. This easy-to-understand reference teaches the methods of Six Sigma, explains their applications, and tests expertise--without confusing statistics and formulas. In no time, you'll develop the skills you need to solve problems, anticipate customer needs, and meet the demands of the most challenging markets. Filled with practical hands-on advice and essential organizational tips, Six Sigma DeMYSTiFieD provides a complete blueprint for developing strategies, plotting growth, and performing at peak efficiency for maximum profits. Simple enough for a beginner but challenging enough for a more advanced student, Six Sigma DeMYSTiFieD is your shortcut to a solid foundation in this powerful improvement methodology. Systems Engineering Standards -- The State of the Art"